WHAT ARE THEY HIDING AND WHY????? Everybody is focused on the Media Blackouts rather than the demise of the dollar. First – Trump is ahead by over 65 points and all references to his support by Mexicans and Blacks is completely blacked out. 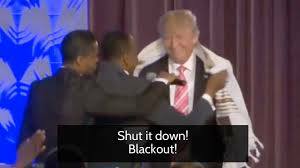 Here at an All Black Church on Saturday – which preaches the Gospel of Jesus Christ in Detroit – Donald Trump is awarded a Jewish Prayer Shawl by Bishop Jackson of this Messianic Church immediately causing the Network to shut down the camera – a Blackout on his appearance. Further – most pictures of the Hillary were also banned on the Main Stream Media, you tube and Google because she now must hold on to something to stand up. So apparently the TV Networks will destroy anyone criticizing there New Savior, Hillary. The problem is Hillary can no longer stand on her own without holding on to something -as can be seen in this video from 15 August 2016. So what you will see during this election – if you really stop and look – is a Man who is garnishing support from across the nation and a woman who’s health is so bad she refuses Press Conference and cannot stand for very long without holding on to something. Her Vertigo seems to be way off. Will it make a difference who wins? Maybe, maybe not – and the results may also be the same as the White House is run by CIA Handlers. It will, however, make a difference to YOU and to GOD how YOU act and who YOU vote for. 1) Port after port has ships lined up unable to unload because they want payments in something other than US Dollars and US Treasury Notes. Check out the Port Manifestos of LA, New York, etc. 2) The US Forth Fleet that protect the Middle East from all out war is having to buy it’s food and diesel in Silver. Dollar are no longer accepted. 3) Finally – according to Jim Rickards the US Dollar goes away 30 September 2016 and will be replaced by the SDR – we shall see. He has been saying this for a very long time. Please pray that GOD helps you and your family prepare for what is coming. Please also pray that the truth is told openly world wide about everything and that these videos and stories we produce are not blocked any more by the agencies that control the Internet. Please also pray that Google and You Tube stop blocking YOU from learning the truth. Great Faith Ministries International | Welcome! Putin asking Obama why the Trump Black Out at a Black Church? CNs Dr David Schneider stating Hillary needs a Neurological Exam…then stating he will vote for her despite the fact that her mind may be shot.